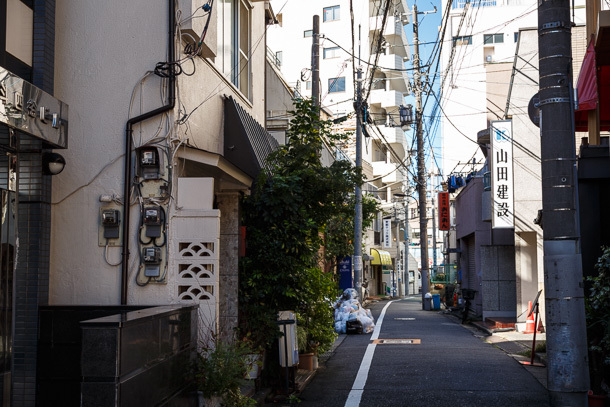 Based on the handful of written accounts I’ve come across, it seems there are two Arakichō (荒木町). 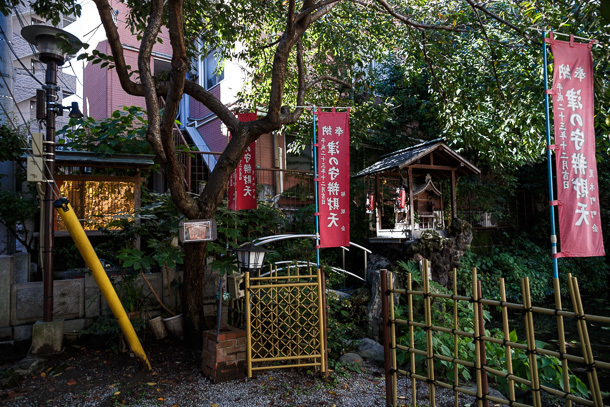 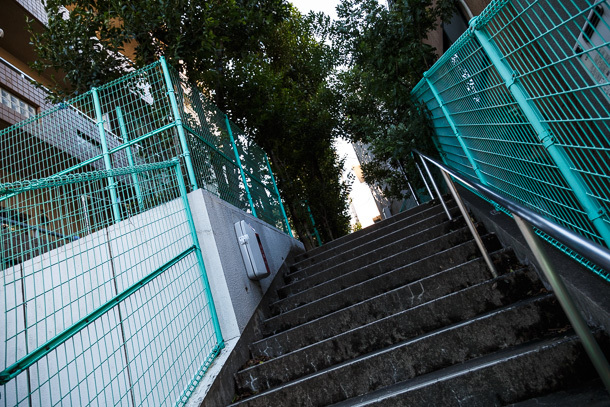 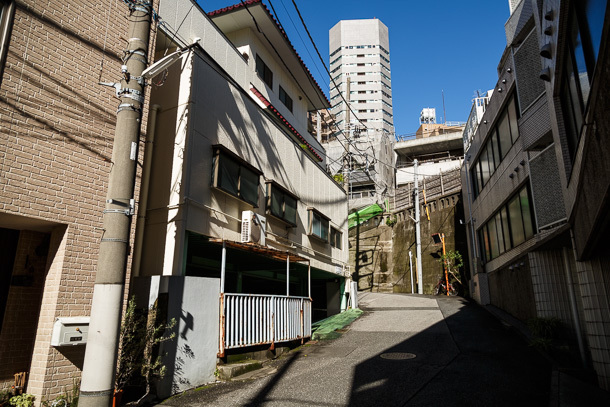 By day, mostly low-rise, generally older housing and a healthy layer of plant matter carpet this ravine carved out of the highland between Akebonobashi Station and Yotsuya-sanchōme Station in Shinjuku Ward. 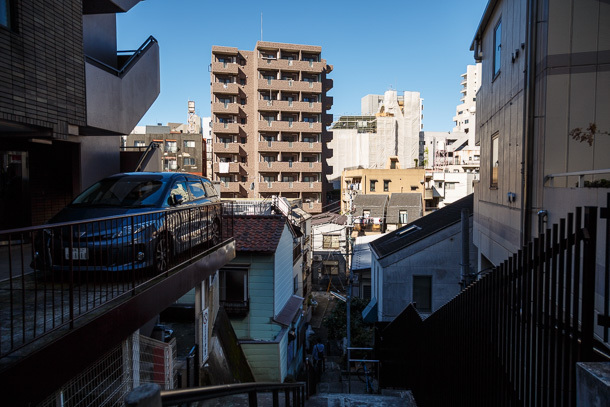 An unhurried but methodical walk through its undulations reveals an example of the surprisingly varied topography of Tokyo, now obscured by buildings, concrete, and a tendency to lose our sense of land features when we’re constantly popping in and out of the subway. 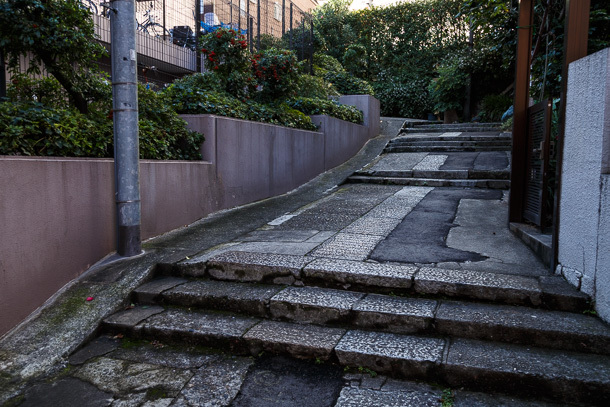 The steep drops and narrow passages, made navigable by sloping alleys and stairs, create zones that vary from warm and sun-washed, to shaded and mossy, to wind tunnels created by Venturi effect where air flow is forced through constricted passages. 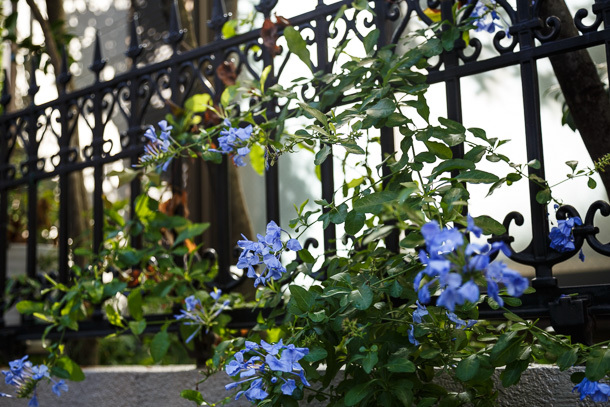 These natural features are the focus of this article. 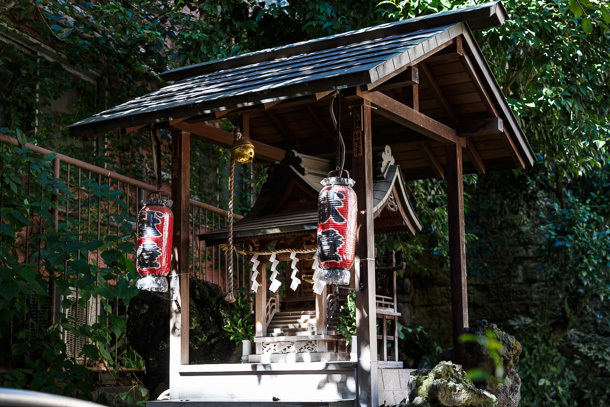 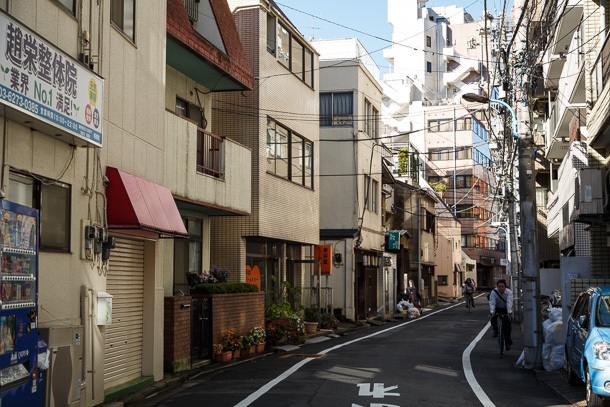 During the day, there otherwise isn’t much to note, as Arakichō is nearly silent, almost devoid of people. 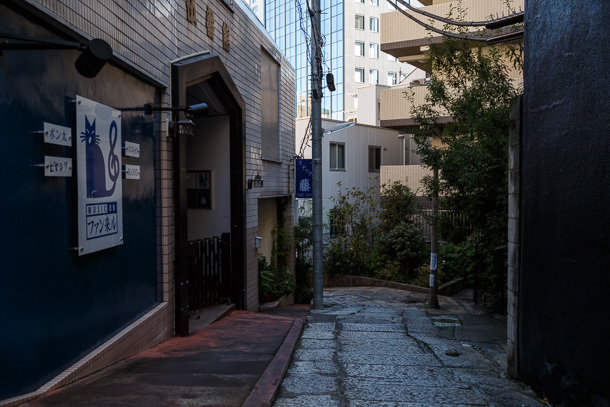 At night, which I would like to observe sometime on a future walk, noren are hung and lanterns lit outside entrances along some of the alleys, indicating the otherwise unmarked presence of small bars and restaurants. 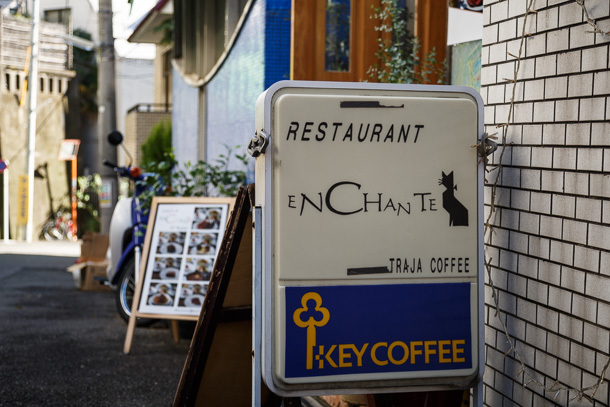 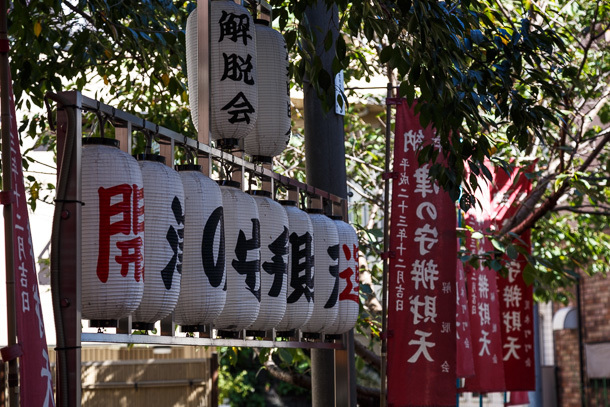 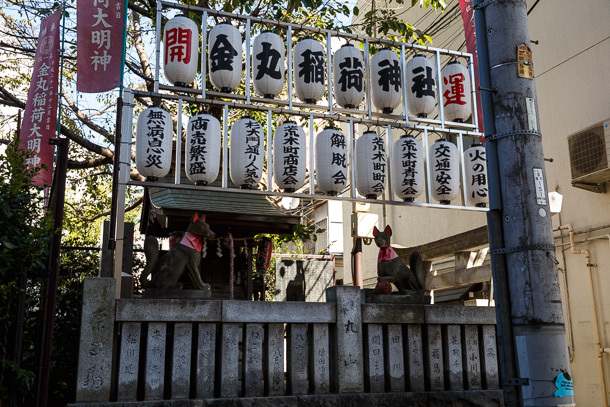 As backlit signs flick on in the main street, the spirits of the once lively Meiji era pleasure district come out to stroll along with contemporary patrons of the remaining businesses. 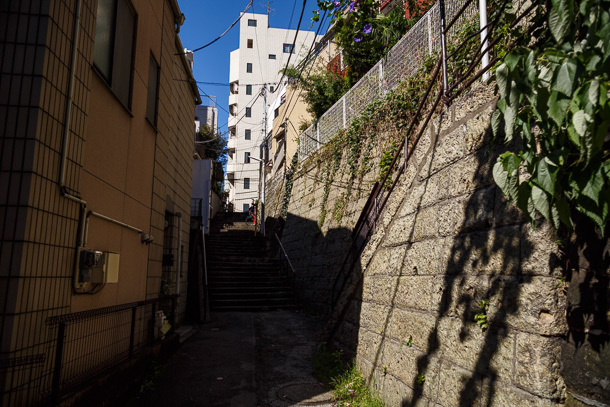 I learned of Arakichō through a news article that described the activities of Suribachi Gakkai (スリバチ学会 Mortar Society), a group of urbanism enthusiasts that focuses exclusively on geological features like this. 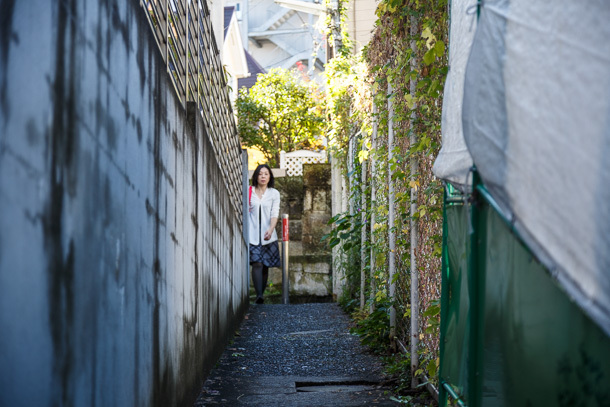 Co-founder Minagawa Norihisa compares these depressions to divots on a grinding stone, which is how the collective got its name. 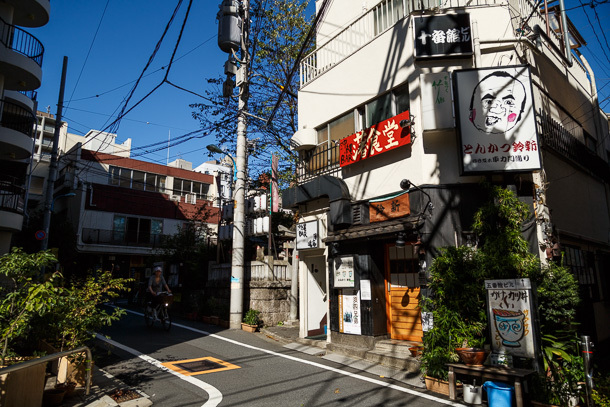 The quirky nature of this group and the clear passion the founders have for their self-directed studies made me want to step away from my shōtengai and hankagai (commercial districts) walks for detour through a different type of Tokyo I might not have otherwise thought to visit. 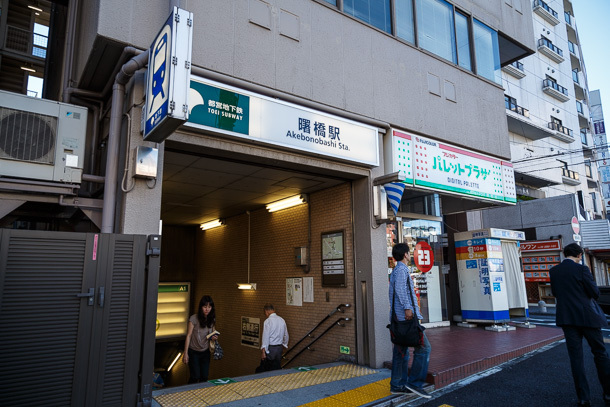 My walk, a portion of the Suribachi Gakkai outing described in the article, begins at Akebonobashi Station. 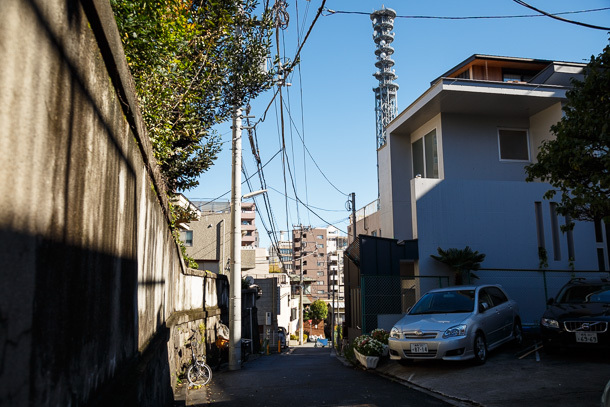 The tower on the grounds of the military base co-located with the Ministry of Defense in Ichigaya becomes a helpful orientation point that I can use to make sure I haven’t wandered too far off course. 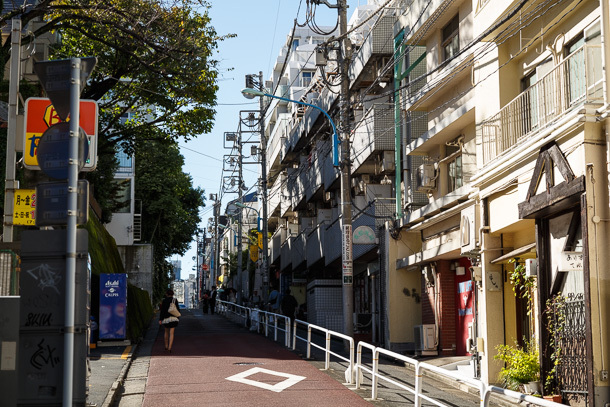 I first head south from the station, along the boundary between Arakichō and Funamachi, which will slope up to a ridge as I head southeast, before plunging into the bowl. 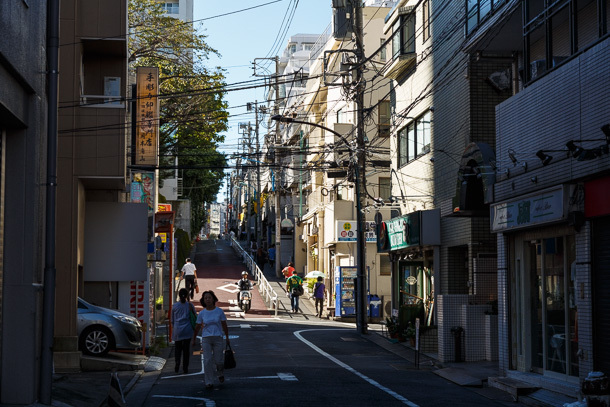 Who says Tokyo doesn’t have hills? 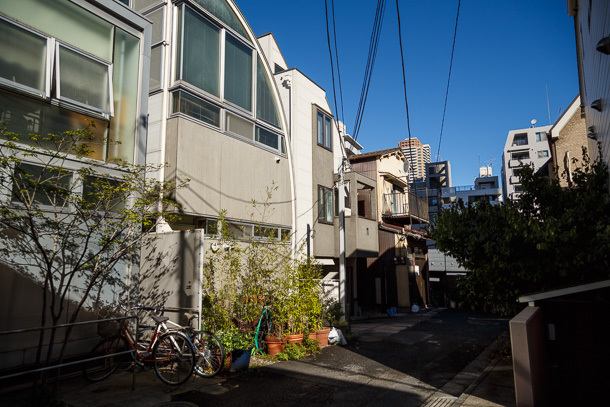 This triangle-shaped area at the northwest corner of Arakichō is primarily residential. 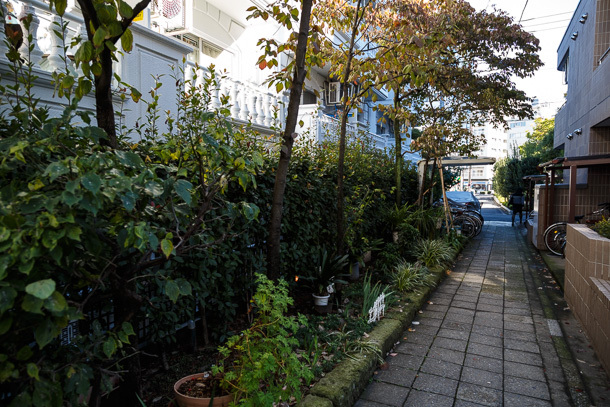 There is prevalent use of vegetation. 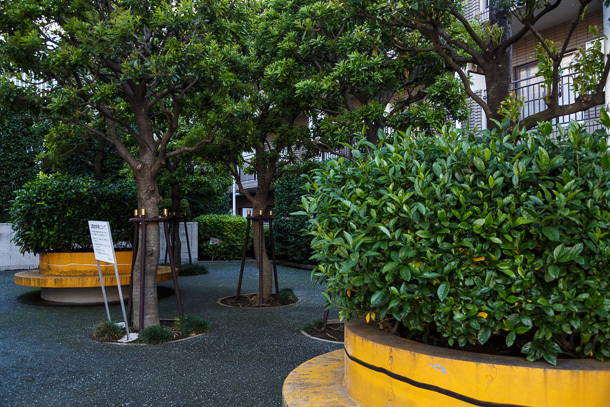 Some is clearly intended to reduce sight-lines into windows, but small pots and planters also hint at tactical urbanism afoot. 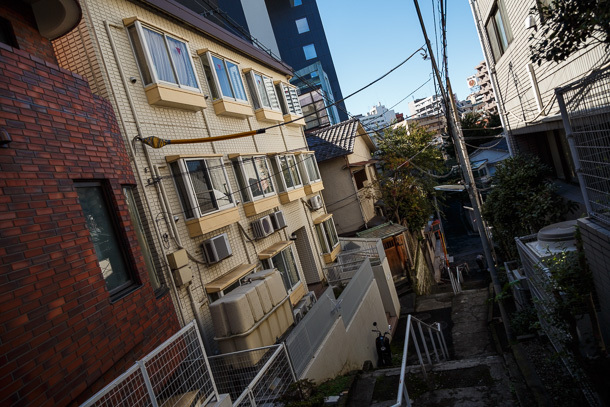 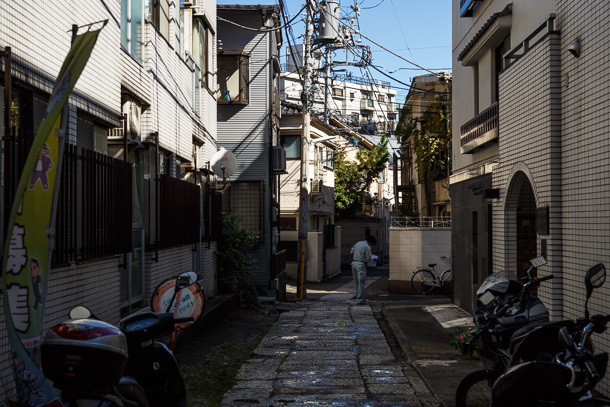 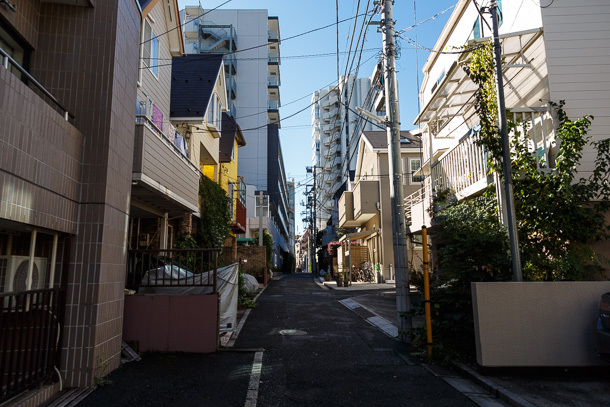 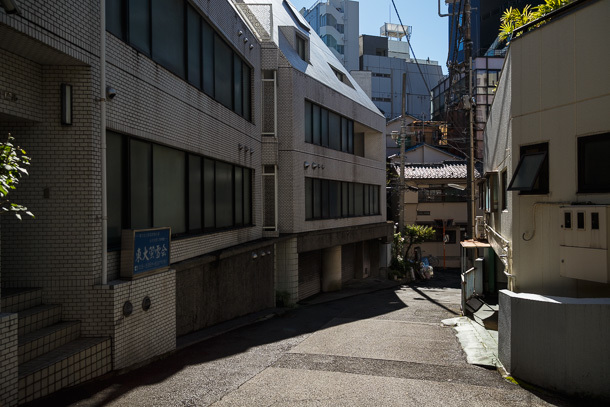 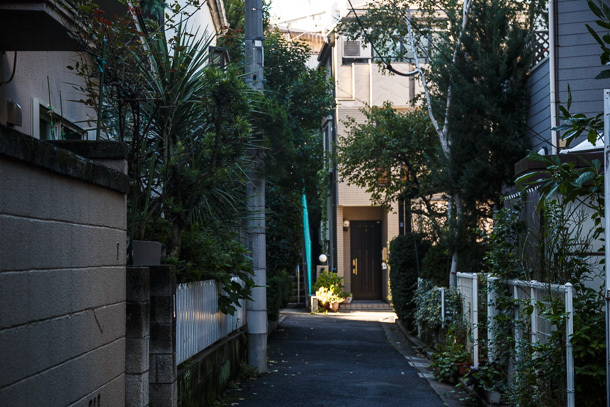 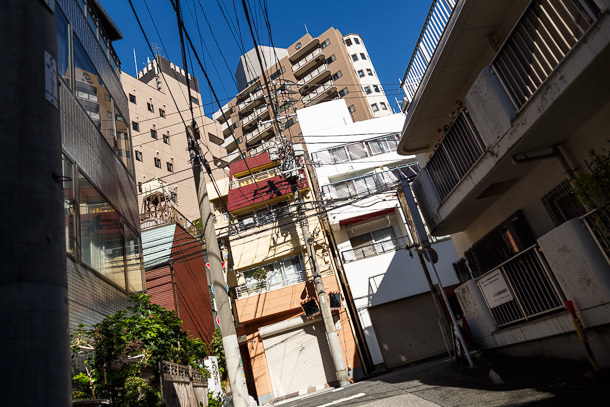 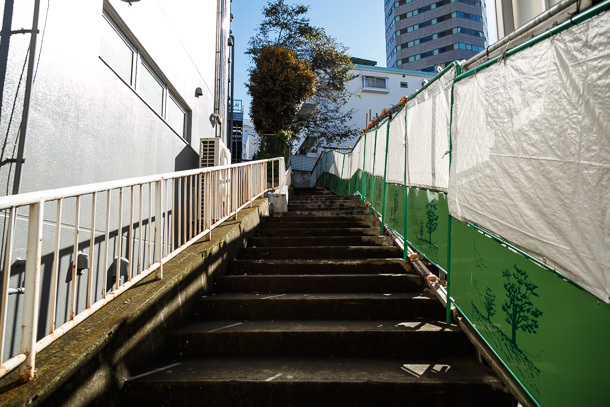 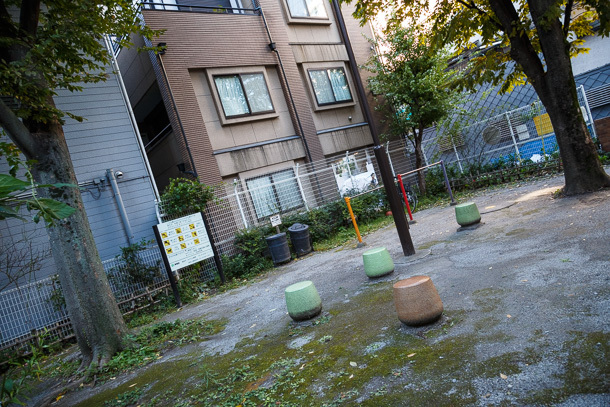 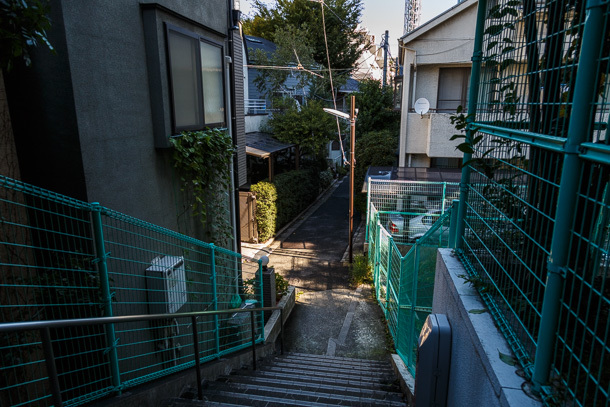 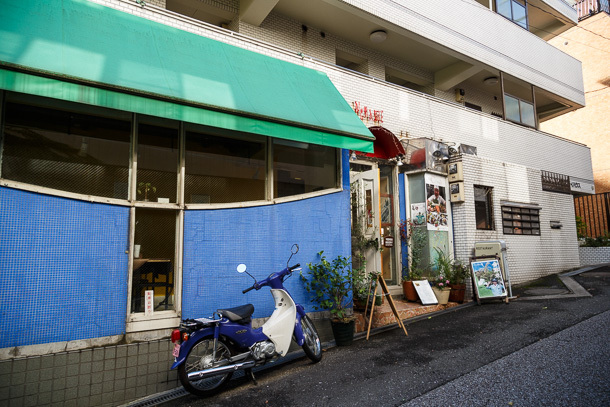 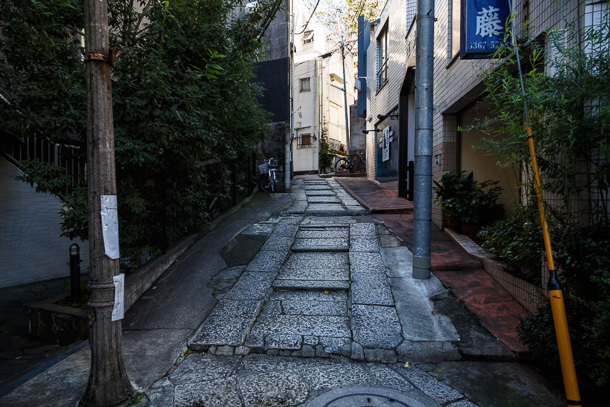 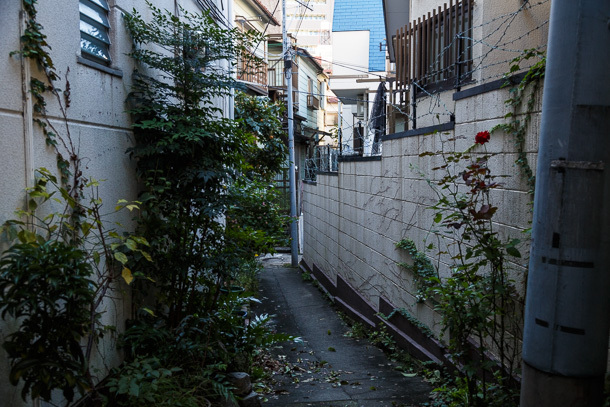 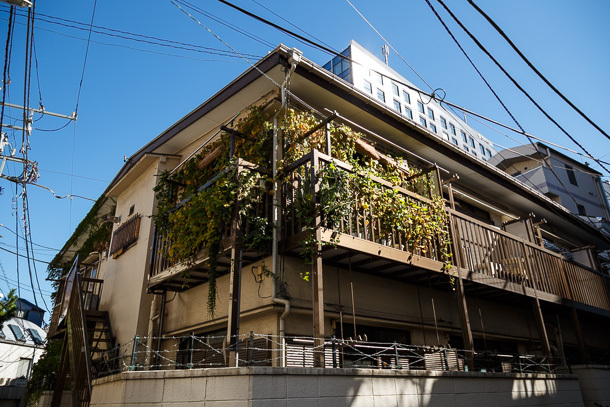 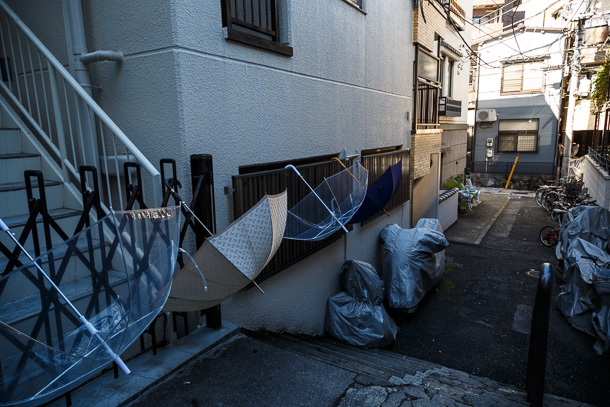 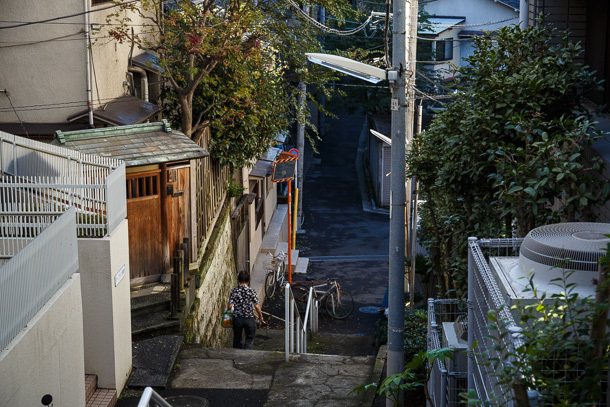 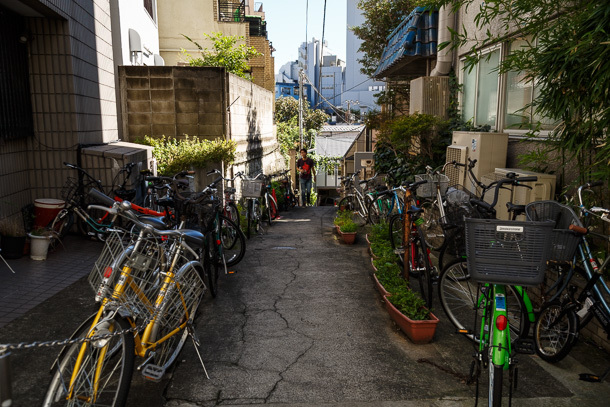 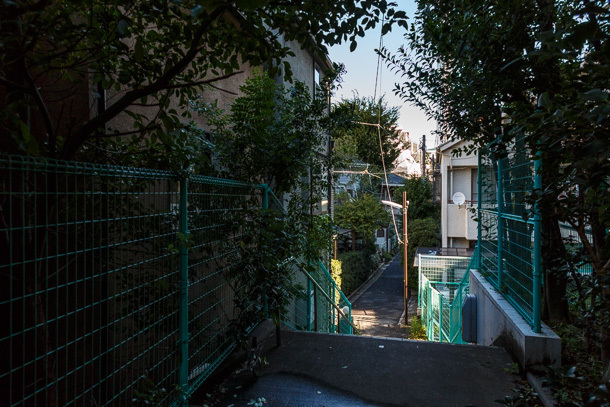 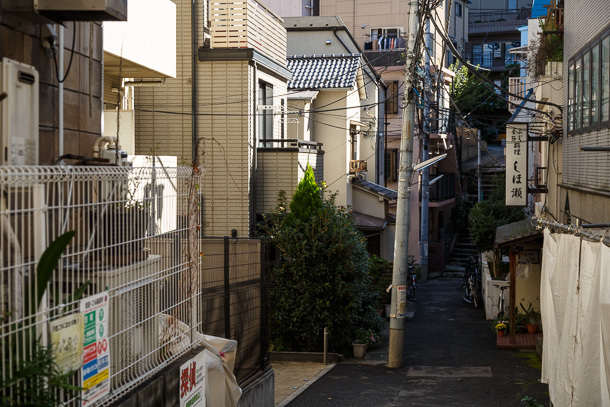 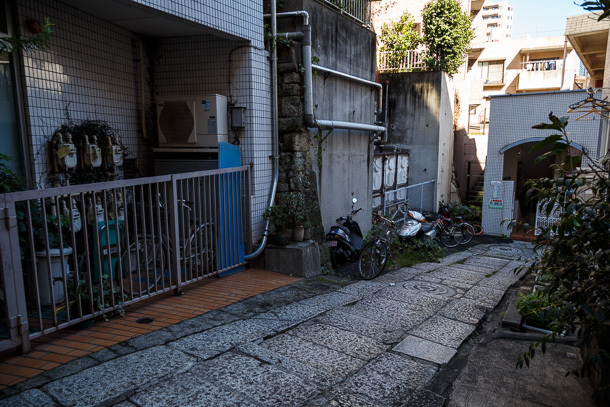 With all of the concrete and asphalt used in Tokyo, non-permanent additions in front of one’s home and along alleys is one way to buffer against the drabness. 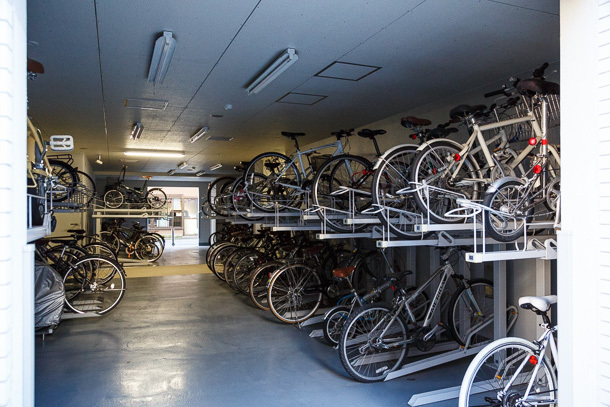 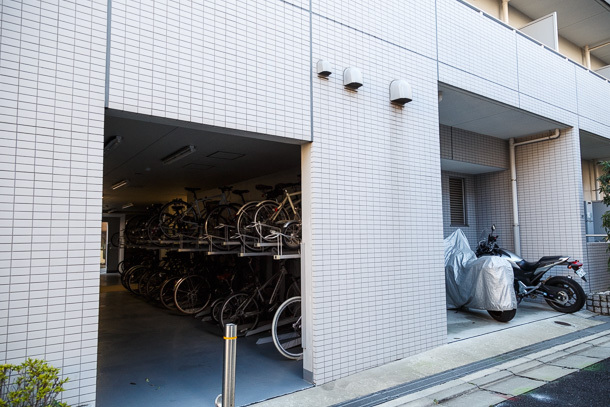 A large, multi-unit monolith kills the mood a bit on a narrow neighborhood street, but it does sport a fantastic enclosed bicycle parking garage. 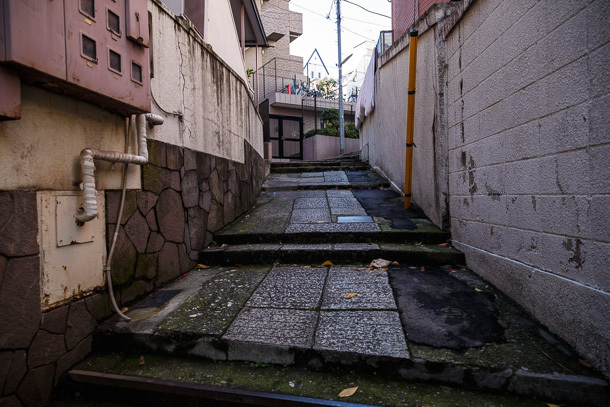 I cross over Gaien Higashi-dōri and begin to zigzag my way south, dropping lower and lower into the basin as I go. 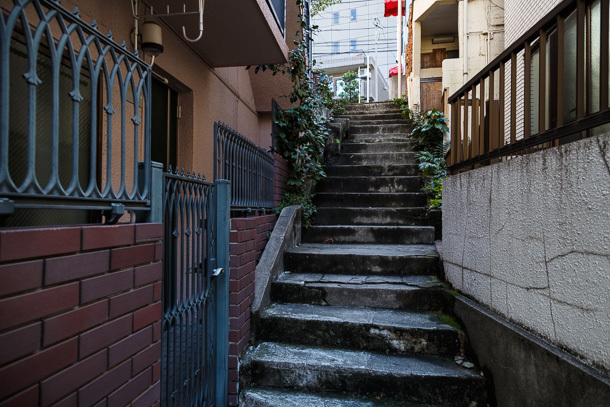 I haven’t descended even halfway when the traffic noise from the arterial road drops away, leaving just me and the sound of my footsteps. 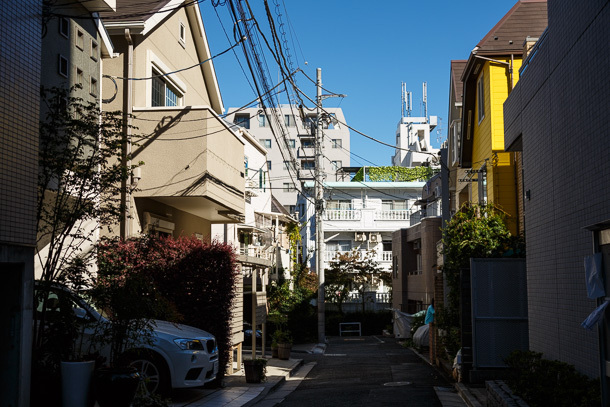 Low-rise housing, some multi-unit, some single family, predominates. 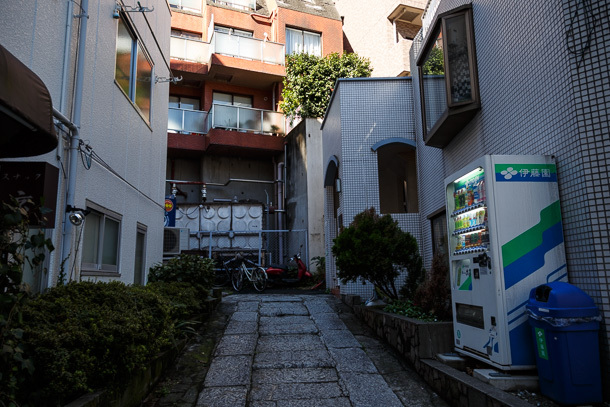 Some of the buildings include ground level shop fronts. 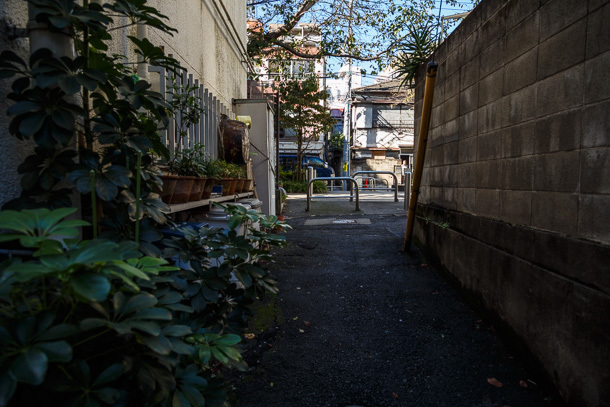 I touch the bottom of the basin, once a large pond, for the first time. 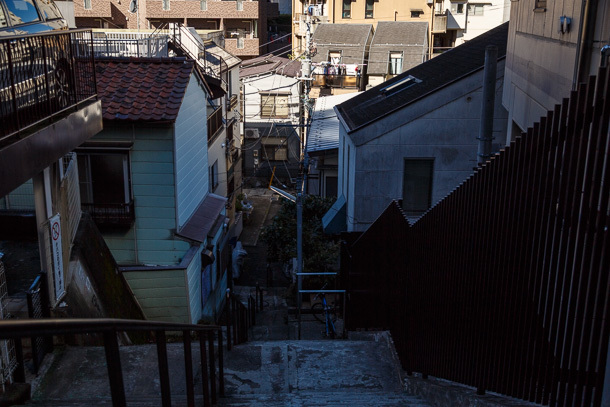 But these stairs and wall are so great I have to run right back up to see what how the view looks from the top. 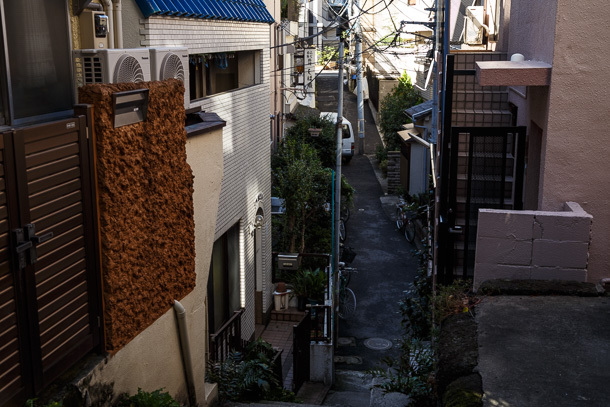 Back at the bottom, bounded space between the homes on either side of the street is just the right size for bunting practice. 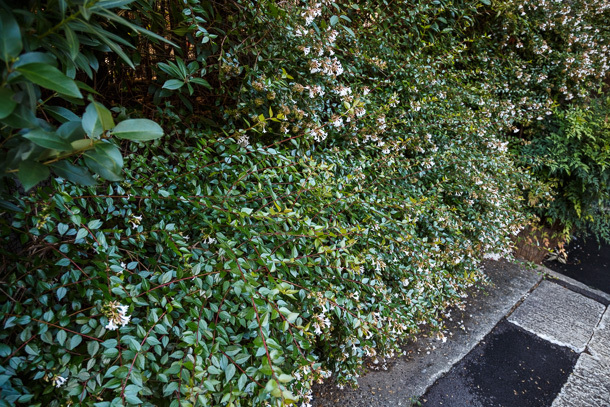 Trees, shrubs and vines create tunnels of shady vegetation, keeping parts of the basin several degrees cooler than surrounding areas. 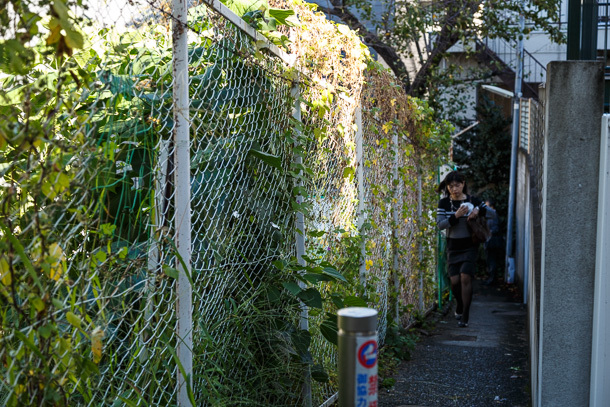 Some of the greenery is even edible. 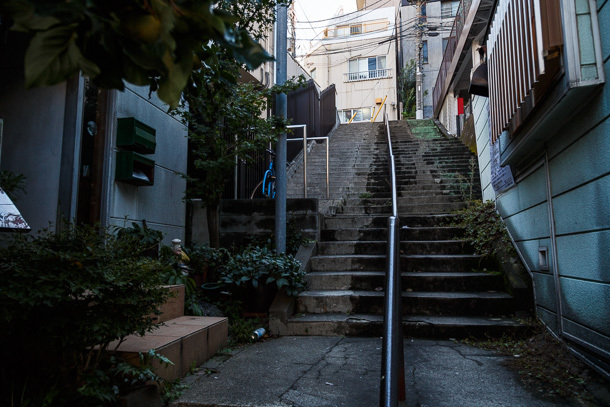 Steep stairs offer a straight line view from bottom to top of the ravine. 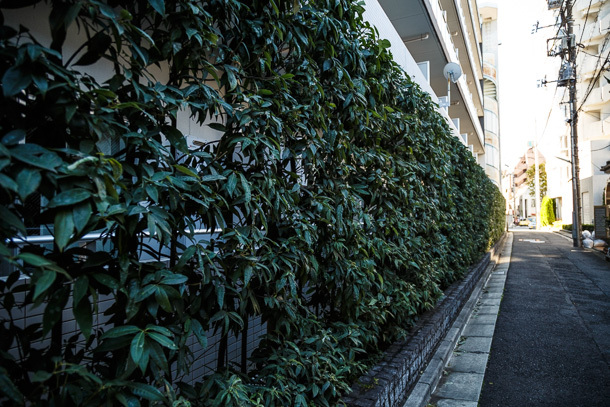 Though up on the surface it’s a pleasantly warm fall day in Tokyo, in these windy, shaded corridors it can be downright chilly. 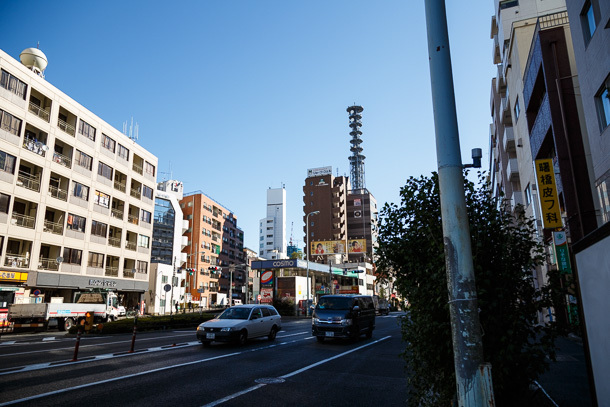 I emerge from the gully into one stretch of the main shopping street, the Arakichō Shōtenkai (荒木町商店会). 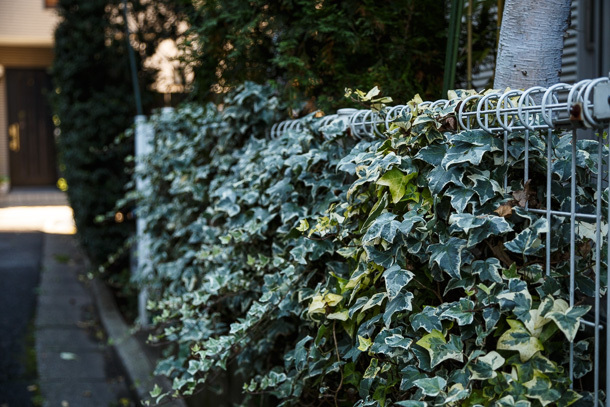 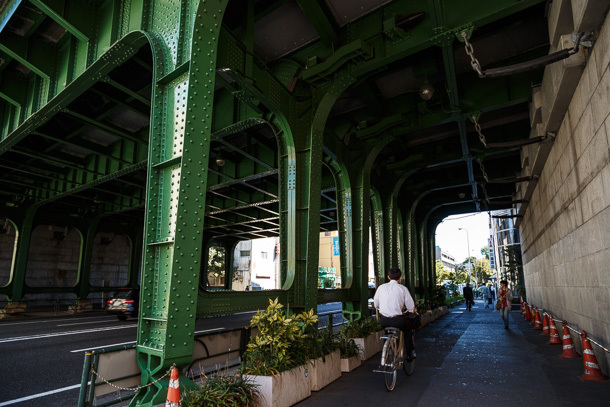 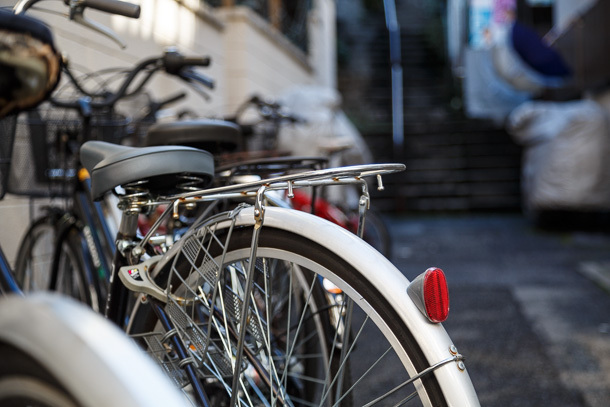 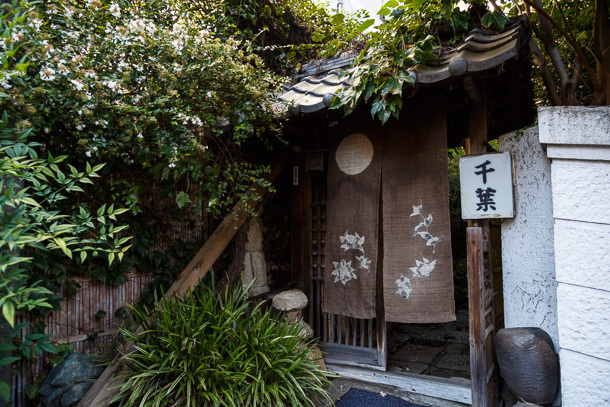 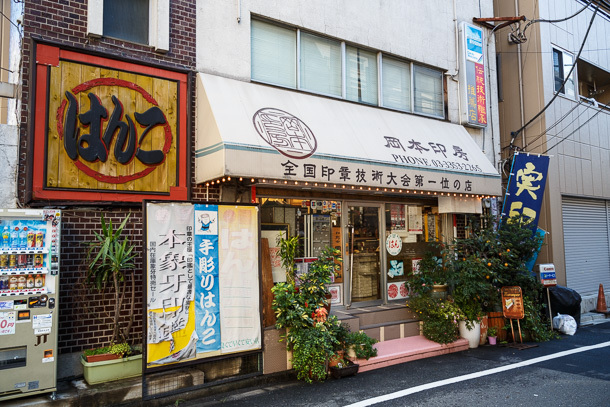 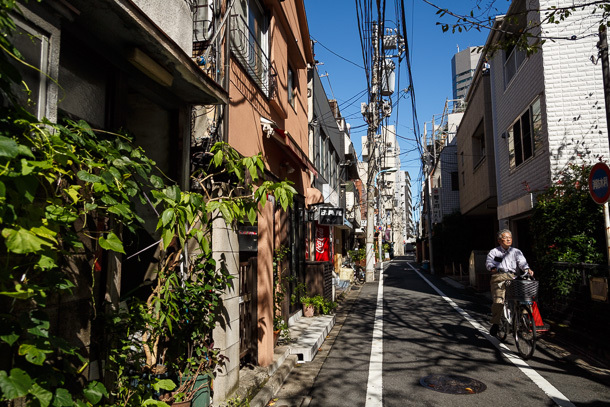 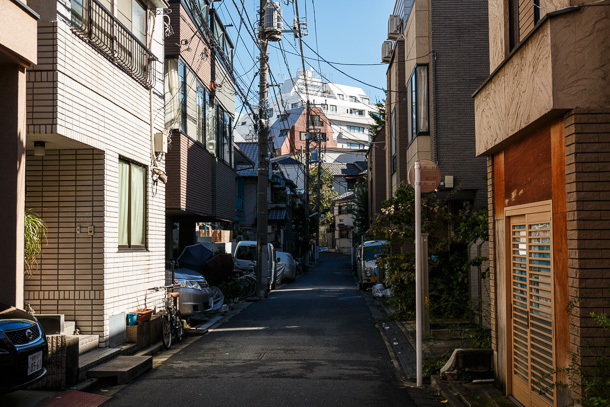 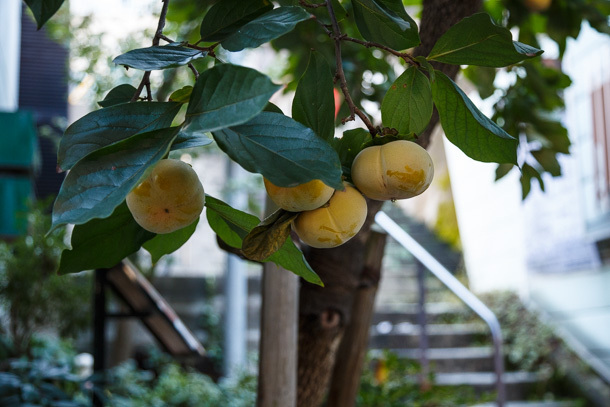 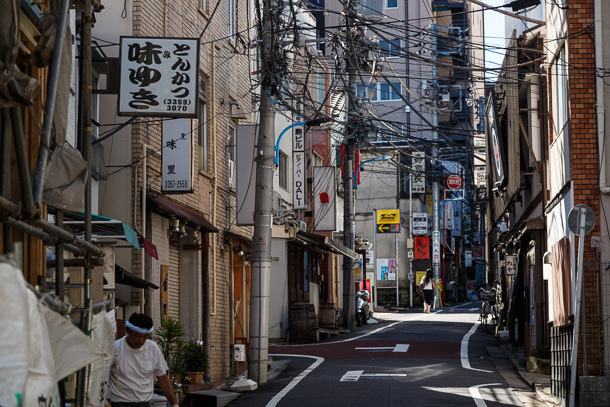 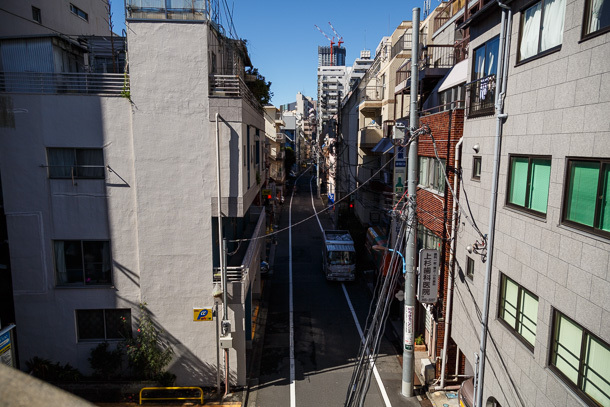 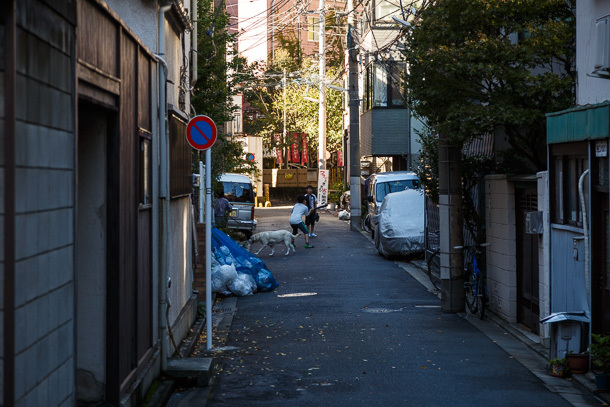 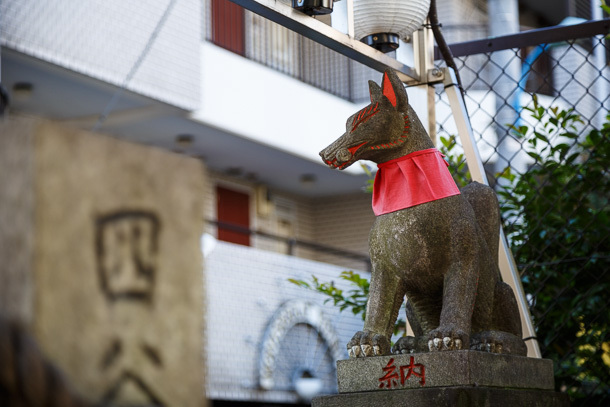 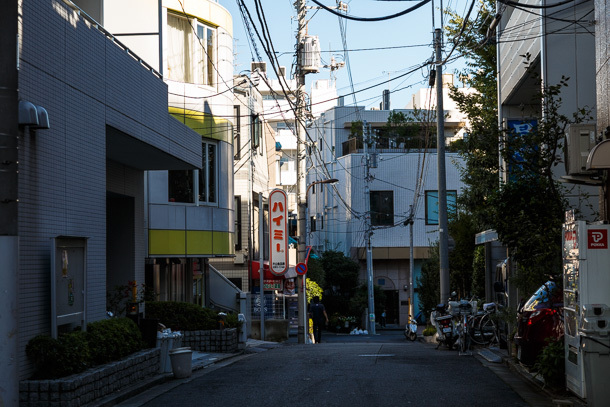 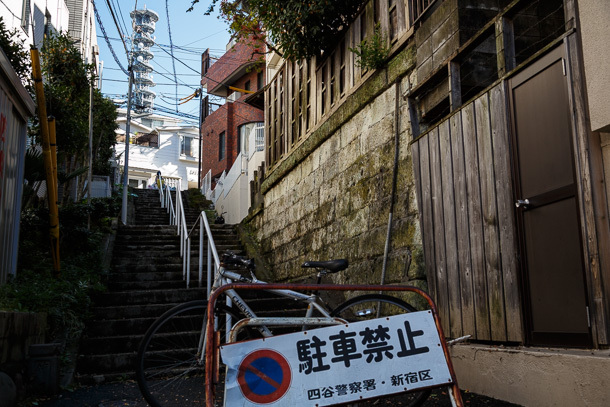 Though Arakichō is situated well into the Yamanote—Tokyo’s highlands and historic preserve of feudal lords and the wealthy—the older, low-rise buildings and mess of power lines feels very Shitamachi, the working class neighborhoods in the lowlands on the east side of the city. 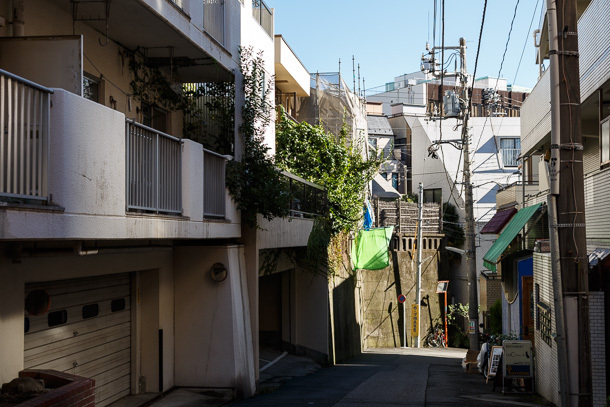 Minagawa notes that this is common for Yamanote neighborhoods set in low areas carved out of the plateau by rivers flowing toward Tokyo Bay, which would have been settled by common folk despite the posher surroundings around them. 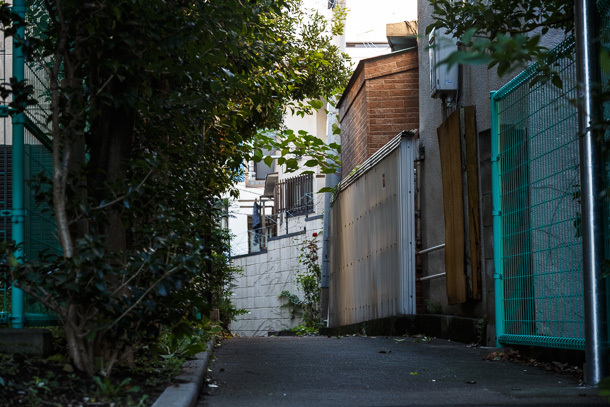 I head back in for a few more turns to complete my sweep. 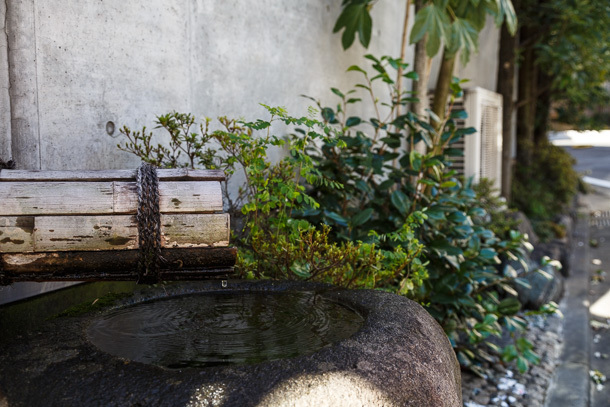 Almost any spare space can be a good space for a potted plant garden. 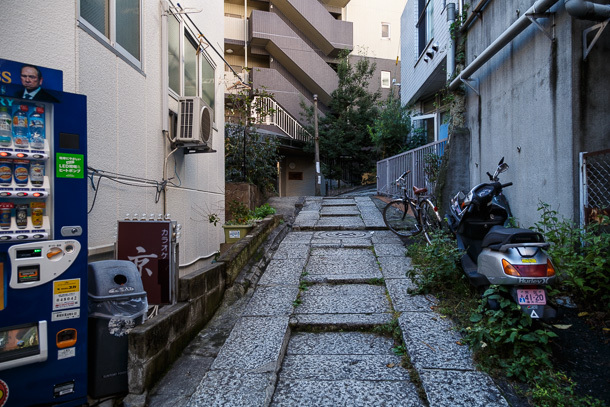 Large stone slabs pave the winding alleys that lead back down to the bottom. 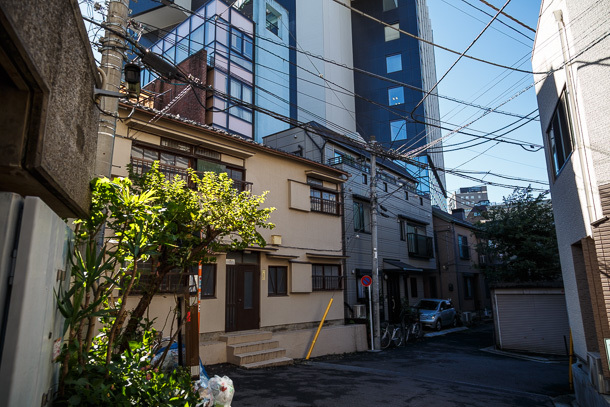 After a while, I’m not quite sure which way is straight up anymore. 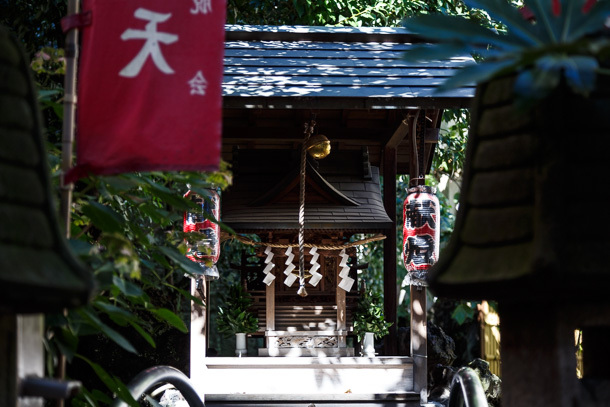 All that remains of the famous pond Muchi no Ike is a small puddle contained by the shrine Tsunokami Benzaiten (津の守弁財天). 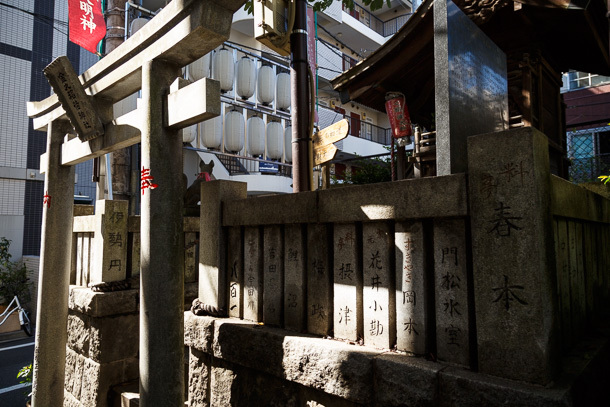 More stone slabs lead the way out for the last time. 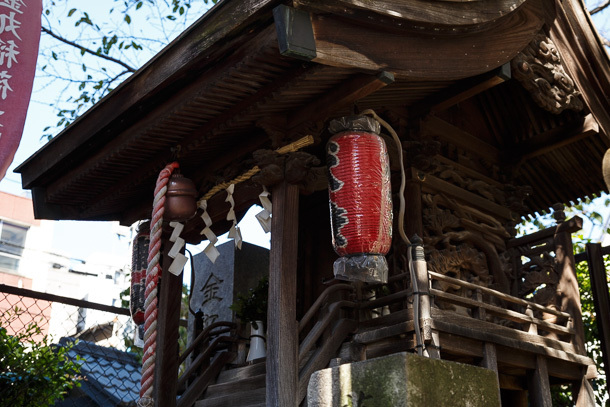 Kanemaru Inari Jinja (金丸稲荷神社) sits at an inflection point at the center of the shōtengai. 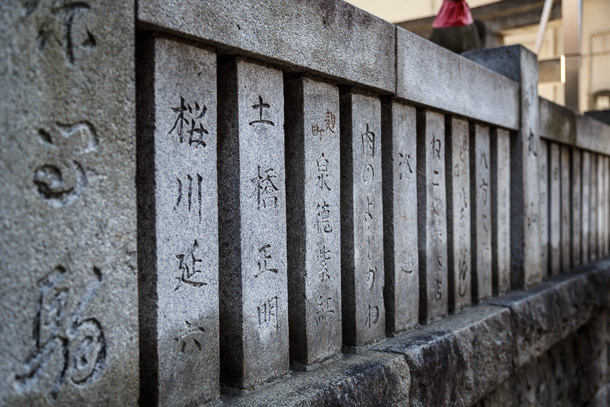 Names of donors, including some local businesses, are carved into the stone fence surrounding the shrine. 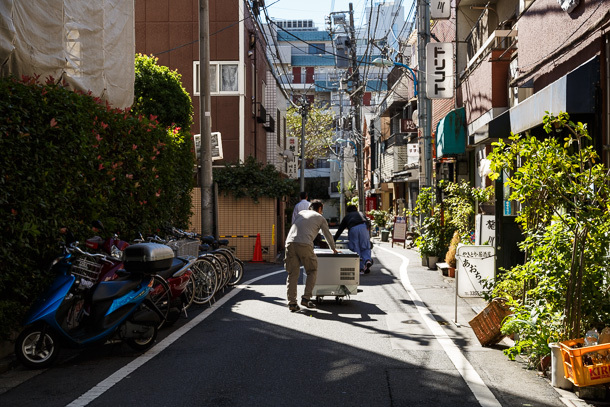 A restaurant refrigerator being rolled down the shōtengai, making quite a racket, is the most action I see all morning. 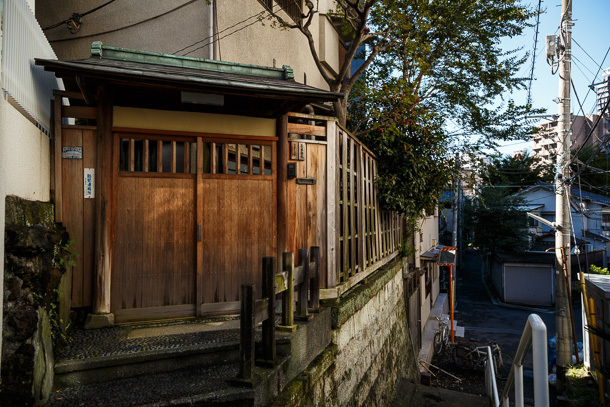 The ghosts of Arakichō leave the work of running foodservice to those still possessing physical bodies in this plane of existence, as they wait for nightfall and the sounds of footsteps in search of small plates and a drink.